Enjoy being poolside, in a high energy environment surrounded by kids? This is your chance to make a difference while having fun and gaining on-the-job experience. Become an Aquatic Aide and volunteer/train alongside American Red Cross Lifeguards, swim instructors, and our very own Splash Camp Counselors. Each participant receives a free season pass to the Terra Linda or Hamilton Pool - based on where they choose to volunteer, a certificate of completion, and a letter verifying volunteer hours. A manual is provided during orientation, which will provide training and tools. Aquatic Aides are assigned to work a minimum of one session, Monday - Friday, 8:00am to 1:30pm or Monday-Thursday 10:15am-12:15pm. Times may vary. We invite all swim aides to enjoy our end-of-season celebration. 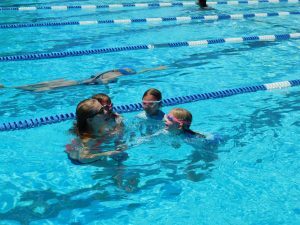 Prerequisites Must be able to swim 150 yards, tread water enjoy working with young children, and commit to a minimum of one full session. Application Deadline Candidates must complete an application, which is due Friday, May 18. If accepted, fee is $36.